STX Films and Universal Home Entertainment send us information for the upcoming home entertainment release of Arron Sorkin's Upcoming film "Molly's Game". The film stars Jessica Chastain, Idris Elba, Kevin Costner, Michael Cera, Jeremy Strong and Chris O'Dowd. Special features on the DVD & Blu-Ray includes Building an Empire - Writer/Director Aaron Sorkin and star Jessica Chastain comment on Molly Bloom and her remarkable story. "Molly's Game" hits VOD on March 27th and retail on April 10th. From Aaron Sorkin, the mind behind The Social Network, Moneyball, and The West Wing, comes the astounding true story of 26-year-old Molly Bloom, who through sheer nerve, wits, and acumen builds an empire and takes over the ultimate boys club: exclusive high-stakes poker in Molly's Game, arriving on Digital March 27, 2018 and on Blu-rayTM, DVD, and On Demand April 10, 2018 from STXfilms and Universal Pictures Home Entertainment. Nominated for an Academy Award® for Best Adapted Screenplay, this sensational film is "one of the most radically entertaining things Aaron Sorkin has ever written" (David Ehrlich, Indiewire) and "Unendingly satisfying" (Richard Lawson, Vanity Fair). 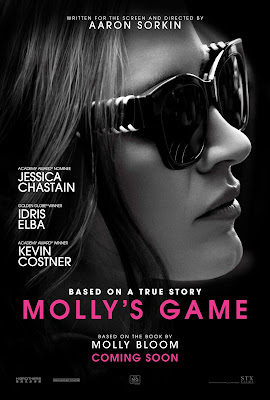 Molly's Game on Blu-rayTM, DVD and Digital comes with special bonus content that takes viewers deeper into the life of Molly Bloom and the making of the film. Two-time Academy Award® nominee, Jessica Chastain (The Help, Zero Dark Thirty), delivers a powerhouse performance as the tenacious Molly Bloom and is joined by an outstanding cast including Golden Globe® winner Idris Elba (Star Trek: Beyond, Beasts of No Nation), Academy Award® nominee Kevin Costner (Hidden Figures, Man of Steel), Michael Cera ("Arrested Development," Superbad) Jeremy Strong (The Big Short, Detroit), Chris O'Dowd (Bridesmaids, "Girls") and Bill Camp ("The Night Of," Hostiles). Written and directed by Academy Award® winner Aaron Sorkin, Molly's Game is based on the true story of Molly Bloom, an Olympic-class skier who ran the world's most exclusive high-stakes poker game for a decade before becoming a target of the FBI. Her players included Hollywood royalty, sports stars, business titans and, unbeknownst to her, the Russian mob. Her only ally was criminal defense lawyer Charlie Jaffey (Idris Elba), who learned that there was much more to Molly than the tabloids led us to believe.